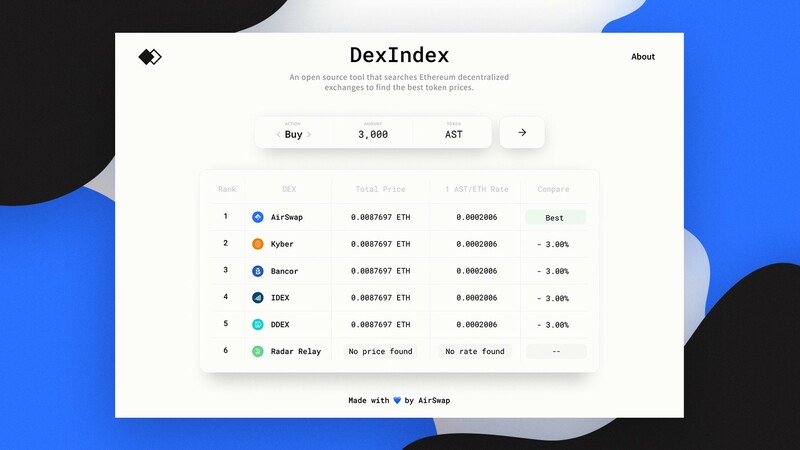 Today, we’re proud to announce DexIndex— An open source tool that searches Ethereum decentralized exchanges to find the best token prices. You can try it now at DexIndex.io. It’s free, and always will be. Ethereum offers a rich decentralized exchange or “DEX” ecosystem in 2019, and new projects are popping up all the time. The most popular DEX’s are carving out niches and meeting demand for many different use cases. Some examples include programmatic token conversion (Kyber), traditional order book replication (IDEX), and settling OTC style trades (AirSwap). All these options fill different needs, but one common question remains unanswered: “Which DEX has the best price for X?” And, while DEX aggregation apps like Totle and Fetch exist, these are proprietary applications that ultimately aim to create a business. Where is the free, open API that crunches DEX price data in seconds for the broader community? Shouldn’t Ethereum developers be able to provide real-time prices in their applications? A decentralized, egalitarian community like Ethereum’s deserves these tools. Enter the DexIndex. 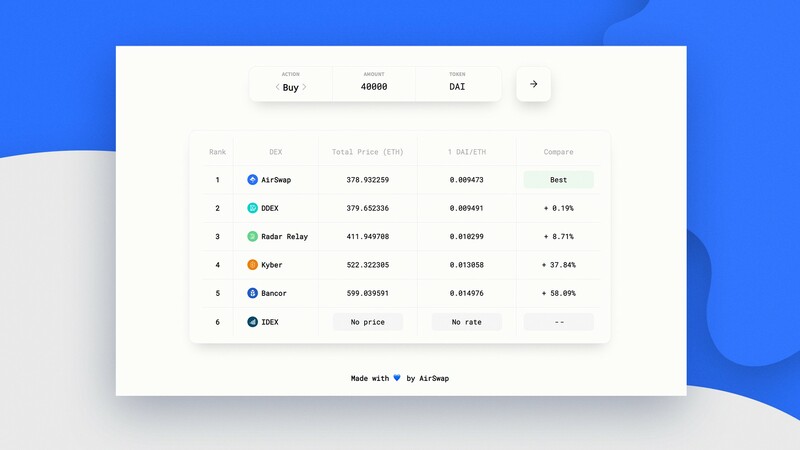 Today’s release supports AirSwap, Bancor, DDEX, IDEX, Kyber, and Radar Relay. We’d like to add support for ForkDelta, EthFinex, and Uniswap as soon as possible. If you’re interested in adding support for these exchanges or others, we welcome you to fork the code and start contributing. If you find a bug, please open a GitHub issue! Thanks to Rob “Crypto Bobby” Paone, Steven D. McKie, Greg Rocco, Jake Brukhman, Spencer Noon, Eric Conner, Anthony Sassano, Eric Meltzer, and the entire AirSwap team for their valuable feedback on this initiative.